This post was written by Peter Sessum, an AAJA Seattle student member. 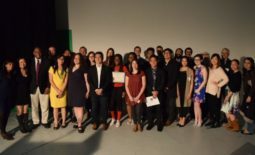 Sessum recently was one of 20 students to participate in AAJA Voices. He received training and mentoring on a variety of media platforms to cover the AAJA National Convention, which was held last month in Los Angeles. 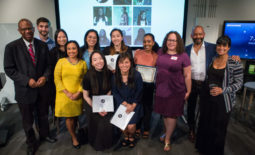 Sessum, a three-time recipient of the Northwest Journalists of Color Scholarship, last wrote about the chapter’s recent innovation salon on Twitter for the AAJA Seattle website. I have benefited from AAJA more than anyone else I know. Workshops, scholarships and of course the mentorships. There is one thing that wraps it all up in one neat little package: The AAJA Voices Convention News Project (CNP). For a week in Los Angeles, students benefited from everything AAJA has to offer. I was lucky enough to be one of them. If the convention is a sprint for most convention goers, for the Voices staff, it is a marathon that started long before registration.Twenty students were selected to be part of CNP. Once selected, we got to work. There were webinars that needed to be completed and story assignment ideas. We were paired with a professional mentor. Mine was William Wan from the Washington Post. I couldn’t have asked for one better. By the time I arrived in LA, I already had one story in the can. I had written my column about how I came to be a journalist. After that, I just needed two more in two different media. This is what separated the journalists from the writers. You have to do research to know what story ideas to pitch. There were still a lot of unknowns heading to the airport, but excitement was high. There is a saying among Navy SEALs, â€œThe only easy day was yesterday.â€ For the convention, the only easy day was Monday. After all the students trickled in, introductions were made and we headed out to dinner. It would be the last time everyone would eat together outside the newsroom until after the convention. Voices Director Marian Liu quickly laid down the law. Three students failed to complete the assigned tasks prior to the convention and were told not to come. From the start, Liu kept the group on task. Every day was full. If we weren’t working on a story, there were tours, guest speakers or some form of training or networking. One day was spent at The Los Angeles Times. With so many moving parts I have no idea how Liu kept it all straight. It was more coordinated than most military operations. Nothing got past our leader. As soon as a student would finish a task, Liu would be calling their name with something new to do. When the convention started on Wednesday I felt like I was in the eye of the storm. Despite furiously working against an ever impending deadline, tweeting updates for AAJA and Voices and trying to work on future stories, I felt calm. For me, it was not my most stressful newsroom. The days were filled. Something was scheduled just about every minute. 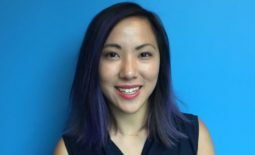 Fortunately, one of my stories was about Katelin Chow, an AAJA Seattle student member, NJC scholarship recipient and a first-time convention goer. Following her got me out of the newsroom and into a couple workshops. When recruiters talk about elevator speeches, they mean it literally. When heading to my next event, I found myself in an elevator with a person from USA Today. I had missed her at the job fair. In the six-floor ride down, I was able to give her my pitch and we exchanged cards. I was one of the lucky few who not only got out of the newsroom, but also had some time at night to get some downtime. I was able to spend time with members of AAJA Seattle. And I even found time to make some new friends. My roommate, however, was working far into the night. National conventions are an Olympics of a conference. While most spring from event to event, the members of the voices project run a week long marathon. By the end of it, I was running like a well-oiled machine. One being operated by a rabid, schizophrenic badger. Despite all the hard work, the Voices project was one of the most rewarding weeks of my life. I left feeling prepared for next year when I graduate and will be looking for a job. I also picked up some skills to make me a better journalist. As a side bonus, I had some fun. I would encourage anyone to get involved with the program. Professionals will be able to mentor the next generation of journalists â€” some of who are really impressive. For students, the CNP is a great experience. They select the best AAJA has to offer, but only the best of those who apply. 2018 NJC Scholarships, NJC-KIRO7 internship applications are open!